The central area of Docking Station's Workshop. 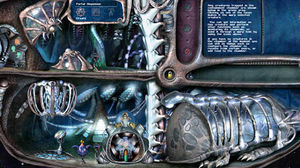 The Workshop contains the Containment Chamber, the Portal Dispensor and the Docking Station Teleporter. Its main function is to contain and control the Warp. It also serves as home to Docking Station Grendels, when the Banshee Egg Stone is installed. As the main portal to the rest of the Warp, it has a high bacterial load, despite the containment chamber's disinfectant spray. This page was last modified on 31 March 2019, at 21:00.